The nanostructuring methods offer an important possibility to vary some of the extrinsic parameters, like shape and size of the elements composing the sample, to systematically study their effect on the magnetic behavior. The properties exhibited by the nanostructured materials can differ significantly from the bulk properties. An example of such system is Fe nanoribbons fabricated through an extrusion process [Biselli 96]. The wire shaped Cu-15 vol% Fe composite alloy samples were produced by the heavy working of spray-deposited billets. With the proceeding of the cold working, the spheroidal Fe particles having about in diameter and originally embedded into the Cu matrix, were drawn into highly elongated, flattened ribbons (see Fig. 4.1), which according to the X-rays diffractograms were oriented along (110) direction. Also, the high and positive enthalpy of mixing that characterizes the Fe-Cu system allows to exclude the formation of any FeCu solid solution. 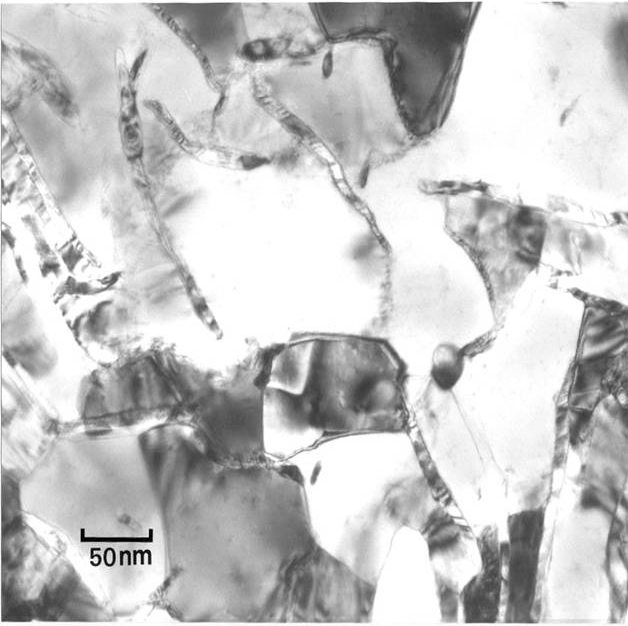 Due to this and the reduced Fe content, the samples consisted of close to isolated Fe particles embedded into Cu matrix. 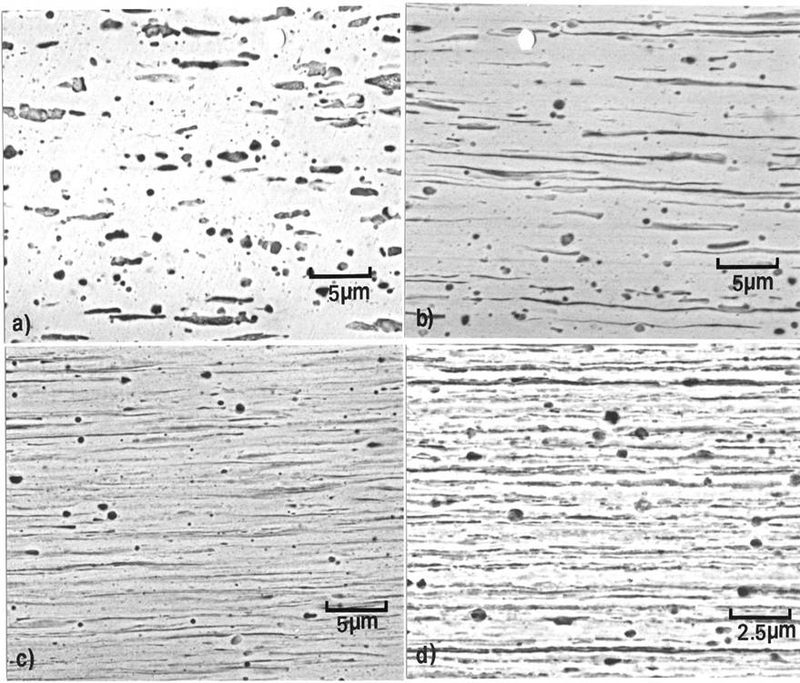 Transmission electron microscopy showed that the thickness of the Fe ribbons present in the cold drawn samples decreased with the increase of the drawing strain from down to , while the ribbons width dropped from down to . As for the length of the particles, the microscopy study was not conclusive due to both the wire geometry of the samples (which together with the particle texture favored the observation of the particle cross sections) and the possible deterioration of the elongated particles continuity induced by the thinning the samples for those observations. The best direct estimate of that quantity was obtained from scanning electron microscopy images of fresh fracture surfaces and yielded a value of the order of a few units of . The magnetic characterization of samples has been performed by the group of A. Hernando, J.M. González in the Instituto de Magnetismo Aplicado (IMA). The magnetization decrease with temperature of the nanoribbons deviated from the typical bulk behavior, as observed by P. Crespo et al. [Crespo 04]. For small enough cross section dimensions this dependence becomes linear as shown in Fig. 4.2. It appears that the reduced size of the nanoribbons modifies the dispersion relation of the magnetic excitations (magnons). The magnons with wave length longer than the ribbon size can not propagate. From a model describing the magnons in the nanoribbons the value of was obtained as an indirect estimate of the average particle length for the sample in which the average cross section was [Crespo 04]. Furthermore, the variation of the ribbon cross section modifies the shape anisotropy resulting from its elongated shape. Due to the large aspect ratio appearing in some samples, this anisotropy can surpass the bcc Fe magnetocrystalline anisotropy (intrinsic parameter). Therefore, the magnetization reversal mechanism and the coercivity will be affected by the change of the particle dimension as observed experimentally. The hysteresis loops were obtained by vibrating sample magnetometer, cycling between and a magnetic field, which was applied along the long axis of the wire-shaped samples (the cold work direction coinciding with the Fe particles axes and the crystallographic (110) directions). In Fig. 4.3 the coercive field is presented as a function of the average width of the particles. Figure: Temperature dependence of the magnetization for the bcc-Fe ribbons with cross section (measured in the Instituto de Magnetismo Aplicado (IMA) by P. Crespo et al. [Crespo 04]). The present chapter is devoted to the micromagnetic simulations performed to analyze the magnetization reversal process taking place in those highly textured Fe nanoparticles. Our aim is to find the correspondence between experimental results and those obtained from simulations in which the local properties are systematically varied in plausible ranges. This stimulated us to attempt to go beyond traditional micromagnetics, trying to include into consideration several major contributions that are not easy to estimate, arising from the nanostructuration and fabrication process, for example residual stress or imperfect shapes, or the broken symmetry at the nanoribbon surface. In this chapter we consider, in addition to the macroscopic values of exchange, magnetization and magnetocrystalline anisotropy, different values of surface magnetocrystalline and magnetoelastic anisotropies, and the occurrence of different textures on the crystalline orientation of the nanoribbons. We also study the thermal reversal process and its possible influence on the coercivity. Figure 4.3: Experimental saturation coercive force dependence on the average width of the Fe nanoribbons (measured in the Instituto de Magnetismo Aplicado (IMA) by A. Martínez).